This manual is for the UpStage Video Hack (2013) and is specifically about the new audio-visual streaming feature, developed by Martin Eisenbarth for the project We have a situation!. It should be used in conjunction with the UpStage v2.4.2 User Manual, but bear in mind that there are some differences between v2.4.2 and the video hack version of UpStage. THIS MANUAL IS A WORK IN PROGRESS! 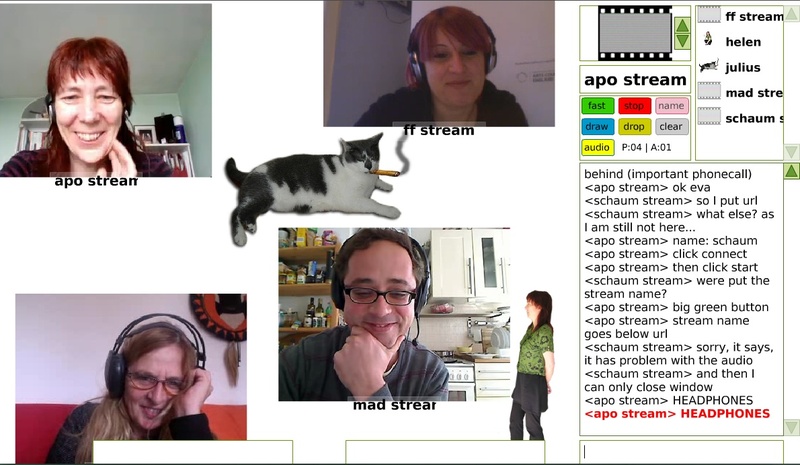 inserting that stream into the UpStage interface, by either creating a stream avatar or uploading an .swf graphic (backdrop, avatar or prop) that has the stream embedded within it. The first option is more straightforward, the second requires some knowledge of Flash. This manual gives instructions on how to stream to a Red5 server, and how to create and use a stream avatar. Some information on embedding a stream in an .swf graphic is provided but this manual is not about how to use Flash. This manual is an extension to the UpStage v2.4.2 manual, specifically to explain the audio-visual streaming feature. For all other UpStage information, please see the v2.4.2 manual.